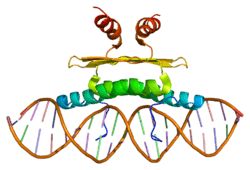 Myocyte-specific enhancer factor 2D is a protein that in humans is encoded by the MEF2D gene. ↑ "Diseases that are genetically associated with MEF2D view/edit references on wikidata". ↑ Breitbart RE, Liang CS, Smoot LB, Laheru DA, Mahdavi V, Nadal-Ginard B (Aug 1993). "A fourth human MEF2 transcription factor, hMEF2D, is an early marker of the myogenic lineage". Development. 118 (4): 1095–106. PMID 8269842. ↑ "Entrez Gene: MEF2D MADS box transcription enhancer factor 2, polypeptide D (myocyte enhancer factor 2D)". 1 2 Youn HD, Liu JO (Jul 2000). "Cabin1 represses MEF2-dependent Nur77 expression and T cell apoptosis by controlling association of histone deacetylases and acetylases with MEF2". Immunity. 13 (1): 85–94. doi:10.1016/s1074-7613(00)00010-8. PMID 10933397. ↑ Youn HD, Sun L, Prywes R, Liu JO (Oct 1999). "Apoptosis of T cells mediated by Ca2+-induced release of the transcription factor MEF2". Science. 286 (5440): 790–3. doi:10.1126/science.286.5440.790. PMID 10531067. ↑ Youn HD, Grozinger CM, Liu JO (Jul 2000). "Calcium regulates transcriptional repression of myocyte enhancer factor 2 by histone deacetylase 4". The Journal of Biological Chemistry. 275 (29): 22563–7. doi:10.1074/jbc.C000304200. PMID 10825153. ↑ Yang CC, Ornatsky OI, McDermott JC, Cruz TF, Prody CA (Oct 1998). "Interaction of myocyte enhancer factor 2 (MEF2) with a mitogen-activated protein kinase, ERK5/BMK1". Nucleic Acids Research. 26 (20): 4771–7. doi:10.1093/nar/26.20.4771. PMC 147902 . PMID 9753748. ↑ Ornatsky OI, McDermott JC (Oct 1996). "MEF2 protein expression, DNA binding specificity and complex composition, and transcriptional activity in muscle and non-muscle cells". The Journal of Biological Chemistry. 271 (40): 24927–33. doi:10.1074/jbc.271.40.24927. PMID 8798771. ↑ Youn HD, Chatila TA, Liu JO (Aug 2000). "Integration of calcineurin and MEF2 signals by the coactivator p300 during T-cell apoptosis". The EMBO Journal. 19 (16): 4323–31. doi:10.1093/emboj/19.16.4323. PMC 302027 . PMID 10944115. ↑ Park SY, Shin HM, Han TH (Sep 2002). "Synergistic interaction of MEF2D and Sp1 in activation of the CD14 promoter". Molecular Immunology. 39 (1-2): 25–30. doi:10.1016/s0161-5890(02)00055-x. PMID 12213324. ↑ Choi SJ, Park SY, Han TH (Jul 2001). "14-3-3tau associates with and activates the MEF2D transcription factor during muscle cell differentiation". Nucleic Acids Research. 29 (13): 2836–42. doi:10.1093/nar/29.13.2836. PMC 55772 . PMID 11433030. Hobson GM, Krahe R, Garcia E, Siciliano MJ, Funanage VL (Oct 1995). "Regional chromosomal assignments for four members of the MADS domain transcription enhancer factor 2 (MEF2) gene family to human chromosomes 15q26, 19p12, 5q14, and 1q12-q23". Genomics. 29 (3): 704–11. doi:10.1006/geno.1995.9007. PMID 8575763. Ornatsky OI, McDermott JC (Oct 1996). "MEF2 protein expression, DNA binding specificity and complex composition, and transcriptional activity in muscle and non-muscle cells". The Journal of Biological Chemistry. 271 (40): 24927–33. doi:10.1074/jbc.271.40.24927. PMID 8798771. Yang CC, Ornatsky OI, McDermott JC, Cruz TF, Prody CA (Oct 1998). "Interaction of myocyte enhancer factor 2 (MEF2) with a mitogen-activated protein kinase, ERK5/BMK1". Nucleic Acids Research. 26 (20): 4771–7. doi:10.1093/nar/26.20.4771. PMC 147902 . PMID 9753748. Zhao M, New L, Kravchenko VV, Kato Y, Gram H, di Padova F, Olson EN, Ulevitch RJ, Han J (Jan 1999). "Regulation of the MEF2 family of transcription factors by p38". Molecular and Cellular Biology. 19 (1): 21–30. doi:10.1128/mcb.19.1.21. PMC 83862 . PMID 9858528. Wang AH, Bertos NR, Vezmar M, Pelletier N, Crosato M, Heng HH, Th'ng J, Han J, Yang XJ (Nov 1999). "HDAC4, a human histone deacetylase related to yeast HDA1, is a transcriptional corepressor". Molecular and Cellular Biology. 19 (11): 7816–27. doi:10.1128/mcb.19.11.7816. PMC 84849 . PMID 10523670. Lu J, McKinsey TA, Nicol RL, Olson EN (Apr 2000). "Signal-dependent activation of the MEF2 transcription factor by dissociation from histone deacetylases". Proceedings of the National Academy of Sciences of the United States of America. 97 (8): 4070–5. doi:10.1073/pnas.080064097. PMC 18151 . PMID 10737771. Kato Y, Zhao M, Morikawa A, Sugiyama T, Chakravortty D, Koide N, Yoshida T, Tapping RI, Yang Y, Yokochi T, Lee JD (Jun 2000). "Big mitogen-activated kinase regulates multiple members of the MEF2 protein family". The Journal of Biological Chemistry. 275 (24): 18534–40. doi:10.1074/jbc.M001573200. PMID 10849446. Youn HD, Chatila TA, Liu JO (Aug 2000). "Integration of calcineurin and MEF2 signals by the coactivator p300 during T-cell apoptosis". The EMBO Journal. 19 (16): 4323–31. doi:10.1093/emboj/19.16.4323. PMC 302027 . PMID 10944115. Slepak TI, Webster KA, Zang J, Prentice H, O'Dowd A, Hicks MN, Bishopric NH (Mar 2001). "Control of cardiac-specific transcription by p300 through myocyte enhancer factor-2D". The Journal of Biological Chemistry. 276 (10): 7575–85. doi:10.1074/jbc.M004625200. PMID 11096067. Choi SJ, Park SY, Han TH (Jul 2001). "14-3-3tau associates with and activates the MEF2D transcription factor during muscle cell differentiation". Nucleic Acids Research. 29 (13): 2836–42. doi:10.1093/nar/29.13.2836. PMC 55772 . PMID 11433030. Okamoto S, Li Z, Ju C, Scholzke MN, Mathews E, Cui J, Salvesen GS, Bossy-Wetzel E, Lipton SA (Mar 2002). "Dominant-interfering forms of MEF2 generated by caspase cleavage contribute to NMDA-induced neuronal apoptosis". Proceedings of the National Academy of Sciences of the United States of America. 99 (6): 3974–9. doi:10.1073/pnas.022036399. PMC 122633 . PMID 11904443. Park SY, Shin HM, Han TH (Sep 2002). "Synergistic interaction of MEF2D and Sp1 in activation of the CD14 promoter". Molecular Immunology. 39 (1-2): 25–30. doi:10.1016/S0161-5890(02)00055-X. PMID 12213324. Linseman DA, Bartley CM, Le SS, Laessig TA, Bouchard RJ, Meintzer MK, Li M, Heidenreich KA (Oct 2003). "Inactivation of the myocyte enhancer factor-2 repressor histone deacetylase-5 by endogenous Ca(2+) //calmodulin-dependent kinase II promotes depolarization-mediated cerebellar granule neuron survival". The Journal of Biological Chemistry. 278 (42): 41472–81. doi:10.1074/jbc.M307245200. PMID 12896970. Beausoleil SA, Jedrychowski M, Schwartz D, Elias JE, Villén J, Li J, Cohn MA, Cantley LC, Gygi SP (Aug 2004). "Large-scale characterization of HeLa cell nuclear phosphoproteins". Proceedings of the National Academy of Sciences of the United States of America. 101 (33): 12130–5. doi:10.1073/pnas.0404720101. PMC 514446 . PMID 15302935. Grégoire S, Yang XJ (Mar 2005). "Association with class IIa histone deacetylases upregulates the sumoylation of MEF2 transcription factors". Molecular and Cellular Biology. 25 (6): 2273–87. doi:10.1128/MCB.25.6.2273-2287.2005. PMC 1061617 . PMID 15743823. Prima V, Gore L, Caires A, Boomer T, Yoshinari M, Imaizumi M, Varella-Garcia M, Hunger SP (May 2005). "Cloning and functional characterization of MEF2D/DAZAP1 and DAZAP1/MEF2D fusion proteins created by a variant t(1;19)(q23;p13.3) in acute lymphoblastic leukemia". Leukemia. 19 (5): 806–13. doi:10.1038/sj.leu.2403684. PMID 15744350. This article is issued from Wikipedia - version of the 5/20/2016. The text is available under the Creative Commons Attribution/Share Alike but additional terms may apply for the media files.